After gunmen claiming association with the terrorist organization ISIS wreaked havoc on Paris with homemade bombs and Kalashnikov rifles, killing at least 129, the Chinese Communist Party is attempting to leverage the incident to gain international support. China, officials claim, also has a terrorist problem. But experts on the Chinese region of Xinjiang home to the Uyghur Muslims say that the causes of outbursts of violence in that region bear little resemblance to extremist jihadi groups like ISIS. 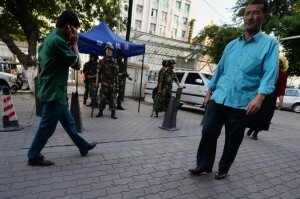 The Chinese government is leveraging this situation to make Western audience accept what they say about Xinjiang. Uyghur separatists refer to Xinjiang by its former name East Turkestan. The day prior—and the day after the Nov. 13 Paris attacks—several state-run media outlets in China posted pictures of black clad armed police storming what looked to be homes in rural Xinjiang. “France’s Paris was hit by its worst terrorist attack in history, with hundreds dead and injured. On the other side of the world, police in China’s Xinjiang, after a 56-day pursuit, carried out a full assault on the terrorists and got great results,” read the text that followed the images. After the article attracted a strong negative reaction, it was taken down. “The Chinese government is leveraging this situation to make Western audience accept what they say about Xinjiang,” said Patrick Meyers, an independent researcher with ETH Zurich University in Switzerland. “China’s accusation against Uyghurs has special political purpose: China links Uyghurs and terrorism to suppress and attack both,” said Dilxat Raxit, a spokesman with the Germany-based World Uyghur Congress, in a telephone interview. Xinjiang is a massive region in the west of China. It was invaded (“liberated” in Party discourse) by the People’s Liberation Army in 1949, and put under iron-fisted rule in which the native Uyghur population, a Turkic Muslim people, have been marginalized and repressed in their own homeland. Uyghurs widely feel that Han people, the dominant ethnic group in China, have migrated en masse and dominated the government and society, leaving Uyghurs on the sidelines. A 2000 census found that Uyghurs made up only 43 percent of the population as compared to 40 percent Han Chinese—a stark contrast to before the communist takeover, where almost 90 percent of the population was Uyghur. Police control is strict, and there are numerous limitations on the free exercise of religion—including the choice to grow a beard, or fast during the Muslim holy month of Ramadan. Uyghurs are the victim of human right oppression because in Xinjiang, there are no human rights, freedom of speech, freedom of press, and freedom of belief. This May, Party authorities in Laskuy, a township in the major Xinjiang city of Hotan, even ordered restaurants and supermarkets to prominently display cigarettes and alcohol, two taboo items for Muslims. As is the case with many minority religious and ethnic groups, the Party has sought to suppress Uyghur culture and language ever since it came to rule the territory. For instance, school children are taught solely Mandarin Chinese in classrooms, and they are forgetting their Uyghur mother tongue. Uyghur groups say that it is partly in reaction to the Chinese regime’s policies that some individuals have taken up arms—five assailants stabbed 33 people to death at a train station in Yunnan Province in March 2014; five Uyghurs attacked a market in Urumqi, the capital of Xinjiang, on May 22, 2014, killing 39. Experts look upon these outbursts as something quite different than a group like ISIS, which has an explicitly religious extremist ideology, and functions as a well-organized, well-funded terrorist outfit. 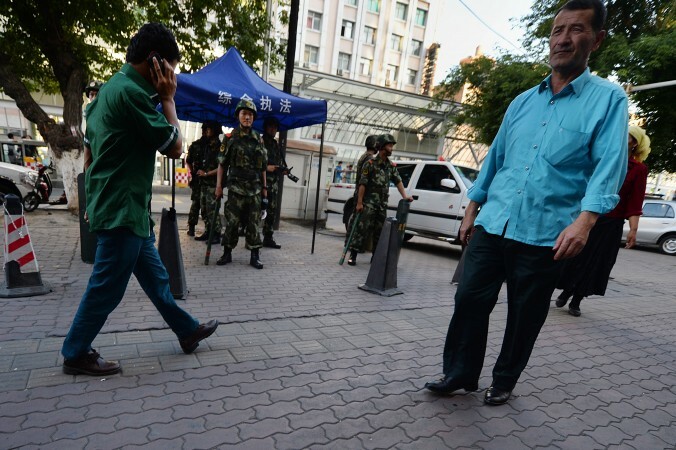 “Uyghurs are very, very angry with China’s policies there, and some groups of people are also unhappy with the situation and hence they act in a violent way,” said Meyers. One of the most well-known cases was the massive demonstration by thousands of Uyghurs in Urumqi, in 2009, prompted by a case of racial violence in a factory in the southern Chinese province of Guangdong. Because international news discusses terrorism and Islam on a very superficial level, the parallel the Chinese government is trying to draw “will work, and the international audience will accept it,” Meyers said. Erkin Emet, a professor at Ankara University in Turkey who specializes in Xinjiang research and the Turkish language, said China has been linking the Uyghurs with terrorism since after the attacks on the World Trade Center on Sept. 11, 2001. “Uyghurs are the victim of human right oppression because in Xinjiang, there are no human rights, freedom of speech, freedom of press, and freedom of belief,” Emet said. In his opinion, though, the international community won’t be convinced by the Chinese regime’s attempt to link terrorism and the Uyghurs—but the Party might score a propaganda coup on home soil.